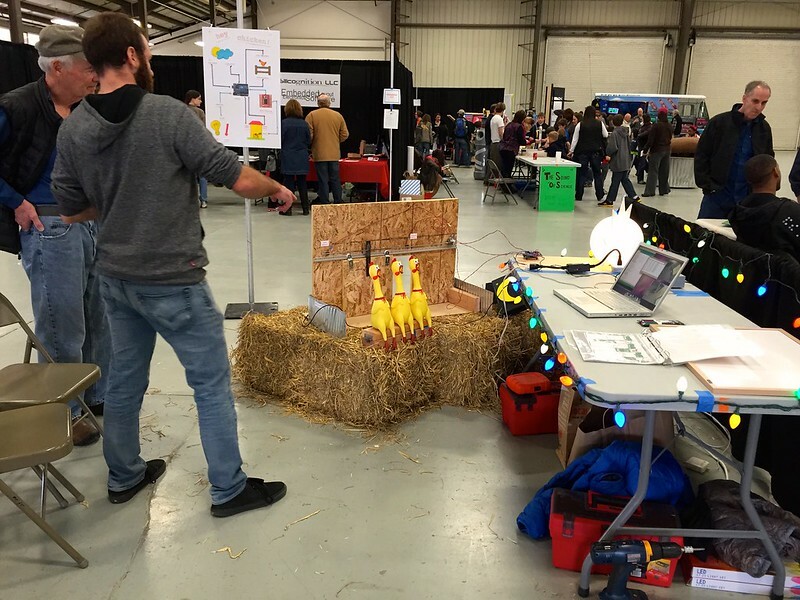 UPDATE: Our booth was voted “attendee favorite” in the responses to the Boulder Maker Faire survey! Woohoo!! Apparently, we aren’t the only fans of chickens and gadgets, LOL. What a weekend! 5,000+ people attended the event and our booth was so busy that Nathan and I forgot to eat or drink anything from 10am to 5pm on Saturday. Oops. We are completely exhausted but we feel honored to have been included. Hey Chicken! was a hit with young and old alike. 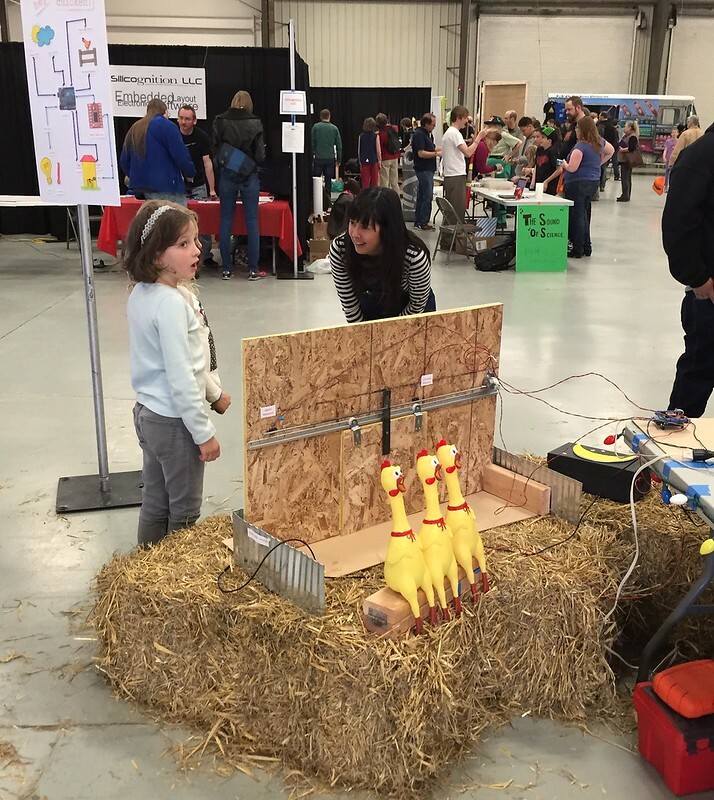 Our rubber chicken assistants kept the itty bitties entertained and made great stand-ins for demo’ing the roost bar pressure sensor. We put the light sensor in a shoebox with a removable lid to create a night and day simulator. 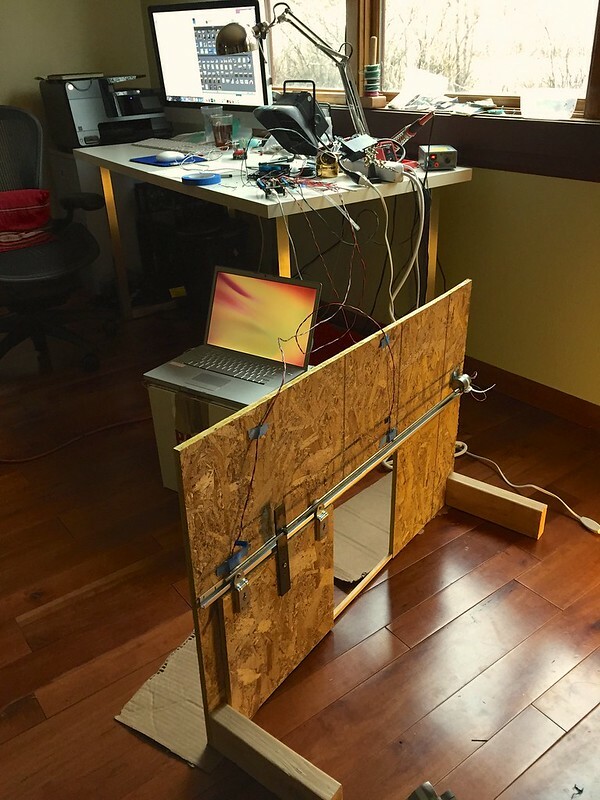 Our goal was to create an interactive exhibit where folks could modulate the sensor inputs and observe their effects on the automatic door operation. Since operating the flat panel heater wouldn’t be very exciting, I repurposed the PowerTail to control the lights, including a globe light dressed up to look like a sun. It turned on when it was “day time” and off for “night time”. One of the biggest insights we gained from our experience was that this project really bridges the gap between generations. There were young people who brought their parents and grandparents back to our booth to share it with them. We heard stories of life growing up on the farm, even a woman who used to get in trouble for spending so much time in the hen house with her beloved chicken friends that she caught lice! There is a humanity to this project to which people are drawn. It appeals to the longing many of us have for connecting with the natural world in our increasingly impersonal, digital lives. 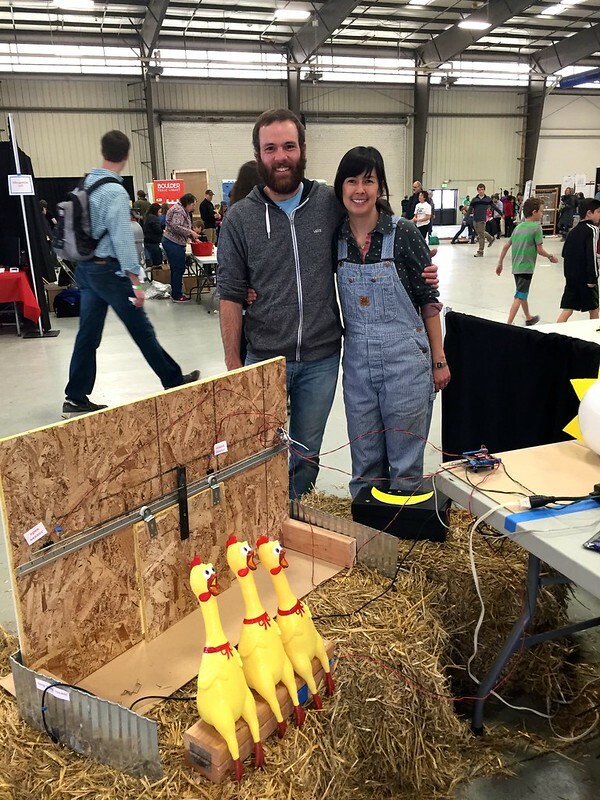 Engineering appeals more to people, especially women, when it involves other things they care about in life, and for many, this includes backyard chickens! Love the display. Would have loved to see the exhibit, and interact with it. Great job. Love the expression on the chickens’ faces. So funny! Kudos to you and Nate. Love it! I may just have to get some chickens so I can install your product once it’s ready! Can I help with packaging?!? Yeah! 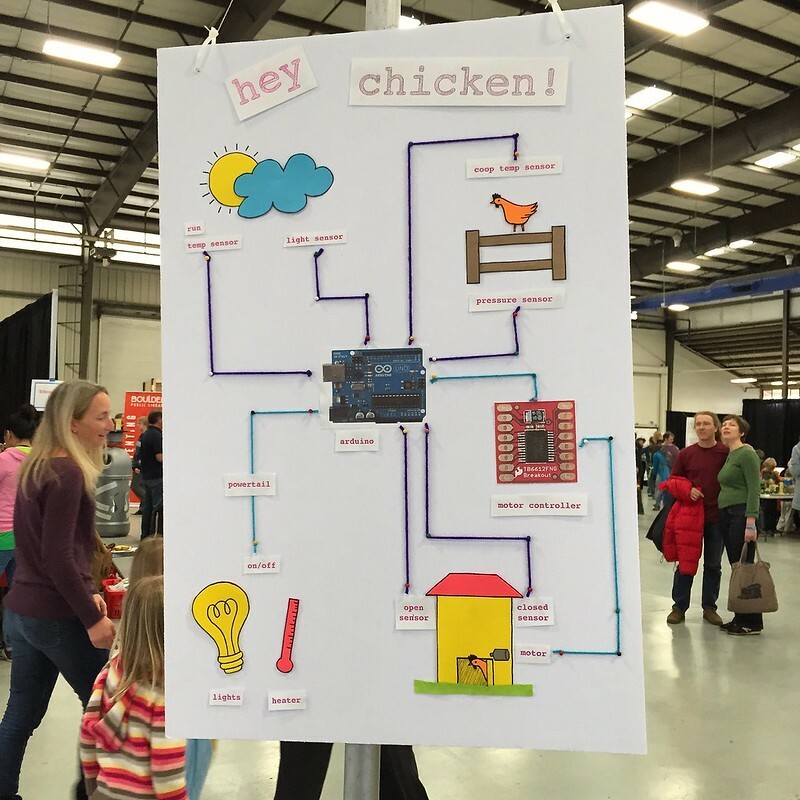 Do you have your Arduino sketch posted anywhere? I’m looking to do a similar setup and could really use some help starting on the sketch.